Vacation week definitely turned into "working vacation week", which felt very much like an oxymoron... (exception; date-day kayaking and an impromptu, extraordinary experience - both of which I am very thankful for!)... loads of Purple Essentials new website work accomplished! We are very excited to be nearing the final stages of completion... it is looking great and becoming a fully functional site - shopping cart and all. Mango Butter - contains a wealth of healthy properties with multiple skin-nourishing benefits that can really do your wonders for your skin. The light, natural scent alone is an alluring reason to use it. While its semi-solid, non-greasy, creamy-soft texture is appealing, it also works quickly to soothe and quench dry skin. It is rich in powerful antioxidants, vitamins and minerals that help to reduce the degeneration of skin cells, restore elasticity and offer a protective effect from the sun's UV radiation. 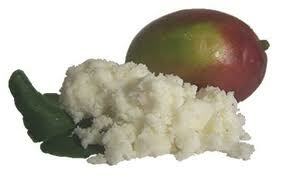 Mango Butter works as an anti-ageing ingredient; fighting free-radicals and plumping up lines and wrinkles (dermatologists often recommend Mango Butter for the treatment of lines and wrinkles, as most people who use it will notice decreased signs of ageing within 4 to 6 weeks of daily use). * Also very beneficial to scalp and hair. There are so many beneficial ways that Mango Butter supports the skin and Purple Essentials is taking advantage of them all! As we utilize this luxurious, pure and simple ingredient in many of our popular, fresh and natural products.